When I heard that Francine Rivers’ new book was on pre-order on my audio book account, I purchased it right away. Over the years, I have enjoyed the Lineage of Grace series, Redeeming Love, and most recently (and my favourite) the two Marta’s Legacy books. I fully expected to thoroughly enjoy Rivers’ newest endeavour. But somehow Bridge to Haven didn’t rise to the occasion for me. Abra is a broken, hurting teenage girl who wants to do life her way; not the way God, or anyone else might have her follow. As a result, she decides to venture into the world of her choosing, only to discover that the grass is not greener over on the other side. We watch as she experiences the path she chose with all of the searching and pining that goes along with it. While the story did succeed in pulling me in, there were several details that bothered me about this book. I won’t go into specifics in hopes of not spoiling anything for you, but I feel the generalities must be said. First of all, some of the relationships in this book and their ambiguous lines between platonic and sexual really creeped me out. Even stepped over the line. Secondly, the ambivalence of those who watched Abra on her journey portrayed to me the exact opposite of what the author intended, per her afterword. They just seemed implausible, and ridiculous. The way her family and friends handled the whole situation was not a case of lovingly allowing her to experience life in her own way until she comes around, but it felt careless, almost complicit in her escapades. And thirdly, the amount of scripture, hymnal quotations, prayer, and christian rhetoric & cultural references, for me, went over the cliff and into the cheese pit of doom. I realize this book is a Christian book, and I myself am Christian. But I also think that there is a fine line between living a life of Christianity and living in a bubble where you are no longer relatable, possibly even alienating, to the rest of the world. This story moves a little too close to the latter. The Marta’s Legacy books did a great job with this challenge (there was a clear stance on certain moral issues, and Christian practices were upheld without preaching all the time), and so I was expecting Bridge to Haven to be similar. 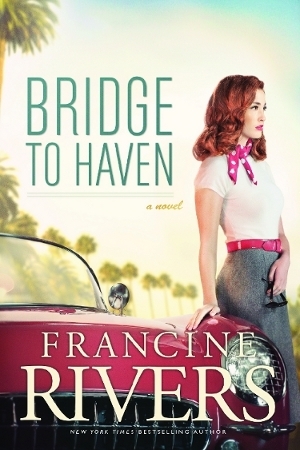 I did enjoy this book, and the writing style that Francine Rivers employs is very engaging and emotion inducing. However, I would only recommend it to people who are already committed to Jesus, or who are searching for God. Anyone who finds a lot of praying and preaching within a book exasperating, you may find Bridge to Haven to be a tad grating. This entry was posted in Muse Reviews and tagged Abra, Christian Books, Christianity, Francine Rivers, God, Jesus, Lineage of Grace series. Bookmark the permalink. After your review, I want to read it even more but I have to wait until summer before I can read since school is really busy.